If you are looking for some of the best sneaker proxies then Smart Proxy is a great choice. They also have setup instructions for using Smart Proxy with AIO Bot and other sneaker bots. The second choice in this list is My Private Proxy which is a bit cheaper and is guaranteed to work. Copping sneakers is becoming really popular these days, and we can expect that it will be even more popular in 2019. Selling them has proved to be a good way to make serious money. However, that can only happen if we know what we’re doing. If we want to start an online business and sell sneakers, we will have to invest in the best proxies possible. Actually, we’ll need multiple reliable proxies that will do the work and a sneaker bot to complement the whole setup. Still, buying a sneaker proxy package can be tricky, and we can easily fall into certain traps. That can only make us waste our money completely. So it is important to gather information beforehand and to always know what we’re buying. 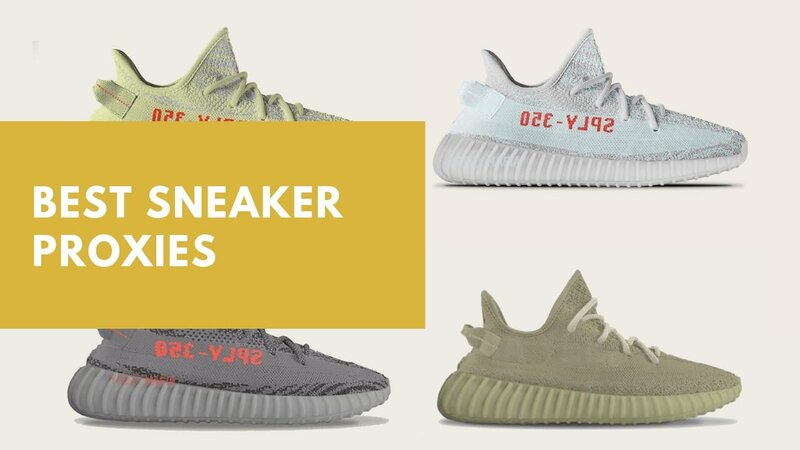 Without further ado, we present this ultimate guide on sneaker proxies that will hopefully make things easier for everyone. Smart Proxy: Excellent sneaker proxies with a large IP pool. My Private Proxy: Cheap proxy packages for sneakers, but high quality. Storm Proxies: Great rotating proxies for copping sneakers. Blazing Proxies: Another affordable sneaker proxies provider. Don’t forget to apply these discount codes during checkout! Apply the coupon at checkout and get 5% off your purchase. Why Do We Need Sneaker Proxies? Why Should We Choose Sneaker Proxies and Not Regular Dedicated Ones? Do Residential Proxies for Sneaker Bots Even Exist? Sneaker proxies are private proxies that were never used before. Therefore, they can cop sneakers from websites more safely. We all know that sneaker websites are restrictive and hard to access. That’s why we won’t be able to find many sneaker proxies out there that can do the work. IPs for sneaker proxies are getting fewer in numbers each day. They are also difficult to create. Hence, their scarcity dictates the price, and we can only expect to pay more for a reliable sneaker proxy than a regular one. However, if we want to cop sneakers and sell them afterward, we shouldn’t consider only the price. As we’ve mentioned before, investing in a good proxy package is a must if we want to be successful. There are other features we should focus on and consider more, and we’ll discuss them a bit later. Getting a good sneaker bot is also imperative if we want to cop sneakers on the web. Sneaker bots are merely desktop applications that we use in order to cop sneakers online. We use sneaker bots mainly to log in to multiple accounts and use them at once. That way, our productivity level is much higher, and so are the chances of successful copping. It’s not just about getting the sneaker proxies — we actually need the best ones for successful copping. Copping may have become too complicated for many. However, even when the chances of success are almost non-existent, if we use reliable sneaker bots, we probably won’t get blocked by apparel websites. Also, the best sneaker proxies aren’t only used to avoid website restrictions, even though that may be one of their primary benefits. We actually need to use the best sneaker proxies just to connect to such websites. Copping is becoming a literal industry where more and more people are starting to earn some serious money. Of course, with a large amount of patience and dedication. That’s why it’s important for us to understand that the best and reliable sneaker proxies actually serve as insurance for our business. If we invest in such proxies, we can relax knowing that the providers guarantee they will work. Simply put, if we’re lucky enough, we can even cop with only one active IP address. However, we can’t expect to get some tremendous results with it. Hence, there isn’t an exact number of proxies that we can say is the best for a sneaker bot. Logically, we can assume that more is always better. Still, getting many proxies can seem impossible, especially if we’re just starting out. If our budget is tight, we might even consider giving up. But, earning money by copping and selling is a process, and we shouldn’t expect to rise to the top overnight. Thus, investing in a small number of reliable sneaker proxies is always a good place to start. Providers sell different packages. Some of them incorporate 50 IPs, while others go up to 250 IPs. So the right number of proxies for us is probably the one that offers the best value for money. However, as we’ve mentioned before, we shouldn’t just go for the most affordable option out there. We must consider everything carefully, as the quality of the proxy package and reliability of the provider should always come before the price itself. We also need to make sure no one else is using any IPs from our IP range. That way, we can rest assured knowing that our IPs won’t get blocked because of someone else’s behavior. So what’s the safest thing to do? We should always go for the largest IP range. That’s usually the package that offers 250 IPs. We won’t use all of them — we’ll use as much as we need. That way, we can be sure our IPs won’t get blocked since no one else will be using one from our IP range. Furthermore, if our budget isn’t limited, we can probably invest in multiple 250 IP ranges and experiment with them. When we decided to enter the copping game, we were confused as to why we were advised to go with sneaker proxies and not the regular dedicated ones. At first, we couldn’t see any difference, and paying more for sneaker proxy packages wasn’t an option. We thought that we could get by, at least at first, with any proxy out there. However, once we failed, we realized that we didn’t think this through. If someone is starting out with copping sneakers, they should always do so carefully and do their homework. The more information they gather on the matter, the more successful they will be later on. Copping sneakers isn’t something we should learn by trial and error, simply because there’s money involved. Our money. Money that we could have invested in a smarter way if we had done a bit of research in the beginning. That’s why we’ll try to explain the difference between sneaker proxies and dedicated proxies and why it’s vital to go with sneaker proxies right from the start. There are two important benefits of these that will help you make a profit faster. Sneaker proxy packages are dedicated like some other proxy packages. For instance, there are packages that are optimized for social media. They are mainly used on one or two websites, which means that their IP addresses are clean. They haven’t been recorded by other websites because of some aggressive use, and they probably haven’t been used on sneaker apparel websites. Using proxy packages that are clean like this will guarantee us a safe connection to websites that offer sneakers. However, successful copping isn’t and can’t be guaranteed. But we can connect them without getting banned or disconnected. We all know that apparel websites ban proxies like crazy. So how do they do it? Once the apparel websites detect suspicious behavior on one account, they don’t put only that account on a blacklist. They will instantly block all accounts from the whole IP range to which the suspicious account belonged in the first place. So what does that mean? For example, we have an ill-intended neighbor that uses an IP address from the same provider as we do. He’s abusing his sneaker bot and placing multiple buying orders. Then, all of a sudden, the apparel website recognizes his behavior and blocks him for good. However, the website doesn’t just block his IP address; it blocks all the IP addresses from our provider in that range, including ours. Therefore, if we have bought a proxy package from an unreliable vendor, we could potentially have a neighbor in our IP range that might get us blocked. That’s the main reason why most sneaker proxy providers sell packages that include at least fifty IP addresses. Now that we’ve seen all this, let’s summarize why we should choose sneaker proxies instead of regular ones. Investing in a sneaker proxy will get us a stable and reliable connection during copping releases. A sneaker proxy will protect us from users who are showing aggressive behavior and might get us banned with them. Basically, by investing in high-quality sneaker proxy packages, we’ll be able to connect our sneaker bot without any major problems. There is one major difference between datacenter sneaker and rotating proxies, and it is also the most important one. Rotating proxies will rotate our IPs at a set time interval. So, at one point, even if our actions were too aggressive, that won’t pose a problem, since there’s a new IP waiting for us around the corner. We just need to be patient. Datacenter sneaker proxies, on the other hand, are virgin and will stay so until we use them for copping. They are also dedicated, and if we’re careful enough, we won’t have to worry about getting banned. We’ve probably heard before that we wouldn’t be able to use residential proxies in order to cop sneakers with success. However, that is largely untrue as there are residential smart proxies that can be a perfect solution for copping. It’s good to mention that all those IP addresses are thoroughly checked and secured. Providers don’t rent them just from any owner. What’s more, they always offer good technical support and customer service that can clear any doubts at any time. Proxy servers like these will work really fast and provide low latency. That is vital for copping since we need a stable IP address once the sneakers are released. So, if we are thinking about buying sneaker proxies, we should always consider rotating residential ones, as they can be a suitable option for copping and will cost much less. We must mention that we should always be careful when deciding on rotating proxies since not all of them are residential. Datacenter proxies don’t trace back to an Internet service provider, while residential ones do. Therefore, anyone who inspects our proxy will be able to see that we are the user. What’s more, websites will thus recognize us as a threat and ban us more easily. Residential proxies provide legitimate IP addresses, so there will be fewer chances to get blacklisted on apparel websites. Thus, our copping sessions will be more stable and secure during releases. Providers usually list multiple features of their proxy packages. However, if it’s our first time buying one, we can easily get confused and led astray. That’s why it’s vital to understand the things we should look for in a good and reliable sneaker proxy package. We’ve decided to create a list of five most important features to look for when investing in such a proxy. Hopefully, it will make things much easier and help everyone avoid common misconceptions. This feature isn’t that common, but some providers tend to put it up front. It might seem tempting, but it isn’t really that important. It is a welcome addition, but it’s not something that should make us opt for a certain package. So what does monthly randomization do? With this feature, we will never have to change our IPs. That means that we will also never have to ask our provider to refresh it for our proxies. We should always look to buy IPs that are located in the same subnet and IP range. As we’ve mentioned before, if someone uses an IP from our range and gets blocked on an apparel website, we will get blocked too. That’s why it is always advisable to buy a whole range just for ourselves. We’ve discussed this earlier, but dedicated IPs are vital for safe copping. They weren’t used before for such actions, and thus are virgin in nature. With them, we can be safe knowing that they haven’t been blacklisted by apparel websites yet. One of the first things we should find out before we even consider buying a proxy package is whether our sneaker bot supports those proxies. Most sneaker bots are optimized for HTTP/S proxies, and most proxies out there are of that type. However, we should always make sure just in case. Finally, the location is the most important thing to consider when buying proxies. We always buy proxies with IPs that are located in tier one countries like the USA. These may very well be the best and the safest proxies to go with. Even if we buy the ones located in the UK, it may happen that they won’t be able to connect successfully. Hence, that’s why we should always make sure that a certain provider offers IPs with locations in the United States. Remember that this is only true if you actually live in the US and plan to cop sneakers on the US-based version of the website! Go for UK proxies or German proxies if you live there.